Former vice-presidential candidate Sarah Palin releases her second book, America By Heart, on Tuesday. In it, she discusses her values, her faith and her identity as an American. But she doesn't mention the one thing America really wants to know: will she run for president? Washington DC's political pundits have been debating, analysing and even scoffing at the idea of a Palin presidency since the moment she burst onto the national stage in 2008. In recent weeks, Mrs Palin has given some of the strongest indications yet that she will run. She told Robert Draper in the New York Times Magazine that she was going through the decision-making process right now, consulting her husband Todd and their children about what a presidential campaign would mean for them. Draper told the BBC he believes she genuinely has not yet made up her mind, but he noted that people who publicly announce they are mulling a run, rarely end up deciding against it. He doubts she can resist the allure of a presidential campaign. "She's a very competitive person," Draper said. "It would be anathema to her to be sitting on the sidelines in 2012, listening to all these other guys invoking Ronald Reagan, talking about their vision for America and criticising Obama, and not be a part of it." Come February 2012, if she is not in the race, Mrs Palin will become just another critic, sniping from her living room - and it's clear that she's not ready for her star to be eclipsed by the likes of former Massachusetts Governor Mitt Romney or Minnesota Governor Tim Pawlenty. But, if she does run, could Sarah Palin win the Republican nomination? There is a probable path to the nomination for Mrs Palin. She's a household name and a fundraising juggernaut - two assets her potential opponents can only dream about right now. She has strong appeal among Republican voters in early primary states like Iowa, Nevada and South Carolina. Wins there could create enough momentum to propel her to the nomination. Scott Conroy, a reporter for Real Clear Politics and author of Palin biography Sarah from Alaska, says that running for president requires the sort of relentless drive he has seen in the former Alaska governor. "She likes the give and take. She likes to be in the ring throwing punches. She enjoys the combative nature of politics," he told the BBC. Still, aside from her core supporters, she has very low approval ratings. Just 35% of independent voters - the group which almost always decides American elections - think favourably of her. However, Draper and Conroy agree that she could turn low expectations into a strength. "She is a pretty shrewd person and I think has come to realise, much as George W Bush did, that you can make a pretty good career out of being underestimated. The bar is so low for her that if she walks on to a debate stage and is able to sound coherent, people will be awestruck," Draper said. Presidential candidates customarily make their intentions known by February of the year before the election. So far though, Sarah Palin's approach has been highly unconventional. She has hired an assorted crew of exceptionally loyal advisers, but none has experience running a presidential campaign. Her staff work out of a virtual office, not a physical one, communicating mostly via e-mail or phone. She has not ticked any of the boxes presidential candidates traditionally do: creating get-out-the-vote operations in early primary states, meeting with the editorial boards of key newspapers, making deferential calls to the "king-makers" in the Republican Party. She appears openly wary of the established Republicans with expertise in mobilising voters and supporters. Draper says she was scarred by her experience of 2008, feeling that Senator John McCain's staff broke her trust. "She realised that people could be thrown under the bus and she's very leery of that," Draper says. "It shows on her. I wrote that she's haloed in static electricity - she lacks the sunniness of Ronald Reagan who she references constantly. She doesn't possess that carefree, unbothered optimism." Unlike her potential opponents, Ms Palin mostly shuns journalists, communicating largely through social media sites Facebook and Twitter. "It's sort of a new mentality for a budding presidential campaign, but it's something that she has been able to pull off successfully so far," Conroy said. "She is really changing not only the way that campaigns work but also how potential candidates communicate with the broader public." But for all the promise of her unconventional approach, she still has some significant hurdles to clear. "She can be thin-skinned and has a hard time taking criticism," says Conroy. "Most politicians at this level are beyond that." So far, her potential opponents are treating her with kid gloves. They even go out of their way to praise her. "None of them want to be perceived as slighting her or alienating her grassroots support which is stronger than anyone else's," Conroy says. But once they are in the midst of a heated race, her opponents will no doubt question how she could be ready for the presidency when she resigned halfway through her first term as Alaska's governor. 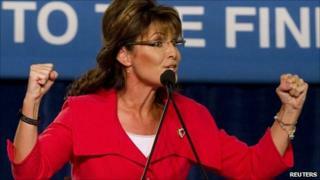 Her new reality TV show, Sarah Palin's Alaska, is attracting a large viewership in the US. Ms Palin is seen delighting in the rugged beauty of her home state, amid shots of its majestic beauty. Although some pundits argue the show is a clever, extended campaign ad, Draper says that it could compound perceptions that Mrs Palin is simply not presidential enough. Even people who admire her spunky demeanour are not necessarily sure that is she ready for the world stage. "Should she declare her candidacy, people really would have to imagine if that woman who climbed a glacier can sit down at a Nato meeting and represent this country well," Draper says. "Even Tea Party people may take some convincing."